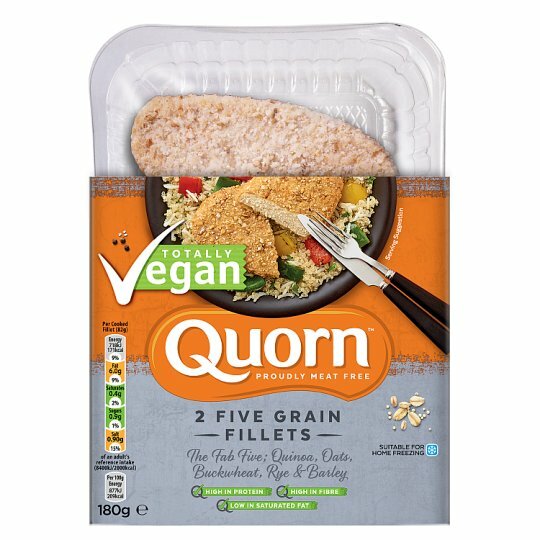 Quorn Vegan fillets are coated in a delicious crumb. Great served with fluffy cous cous and roasted vegetables. Quorn products contain mycoprotein, which is a nutritionally healthy source of protein because it's high in protein, high in fibre and low in saturated fat. Keep refrigerated & use by the date shown on the front of pack. Once opened eat within 24 hours. Quorn Five Grain Fillets can be frozen on day of purchase & kept for up to 3 months. Do not refreeze once thawed. Oven cook (From Chilled): Remove all packaging. If cooking from frozen, cook for 20 minutes.